Happy Friday and welcome to another installment of my Forensic Friday series. This week we are going to cover PowerForensics’ Get-ForensicMftSlack, a cmdlet that returns Master File Table (MFT) slack space. For those not familiar with the concept of slack space, it is simply defined as unused space on the disk. MFT slack is specifically the unused portion of a Master File Table record entry. By default, the Master File Table is composed of records that represent a partitions files and directories. Each MFT record has a set number of bytes reserved for it on the hard drive, typically 1024 bytes (the number of bytes reserved for the MFT record entry can be found in the Volume Boot Record). When a MFT record entry does not use all of the bytes that have been allocated to it, the remaining bytes are referred to as MFT slack space, an area on disk that attackers have been known to hide their tools. 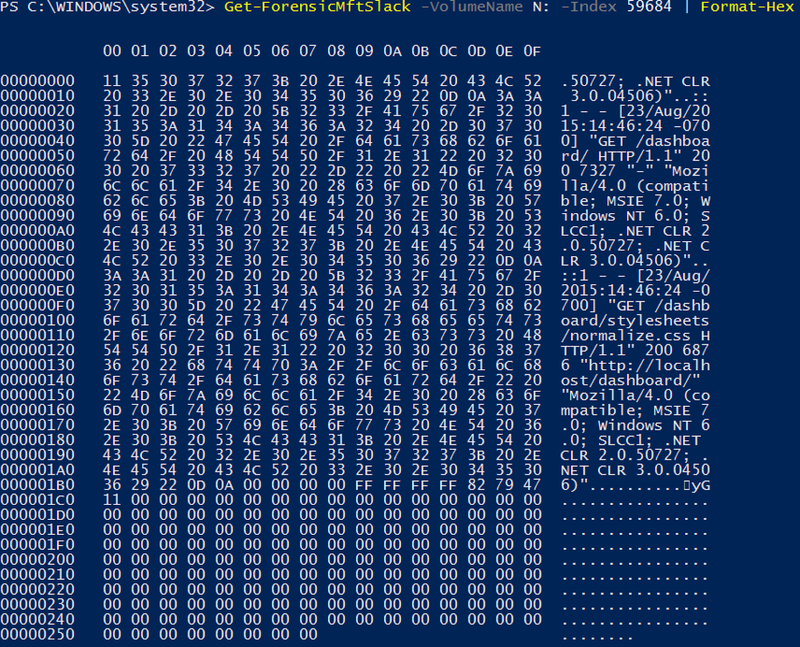 Lets use PowerForensics to provide a specific example of MFT slack space. We start by using Get-ForensicFileRecord to get a specific FileRecord object (MFT record entry). Each FileRecord object has an AllocatedSize and a RealSize parameter. AllocatedSize represents the number of bytes that have been reserved for this particular MFT file entry, while RealSize represents the number of bytes that are actually being used by the entry. 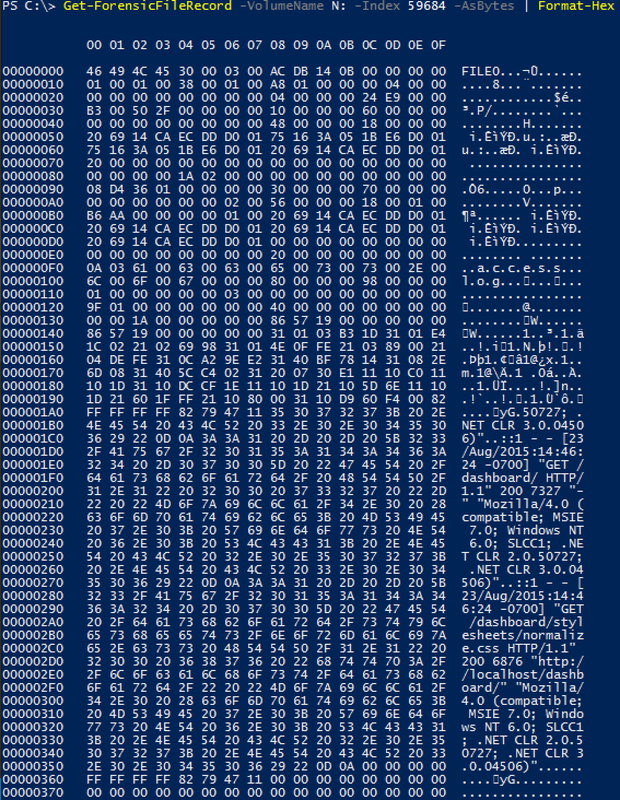 Below you can see a hex dump of the MFT File Record. 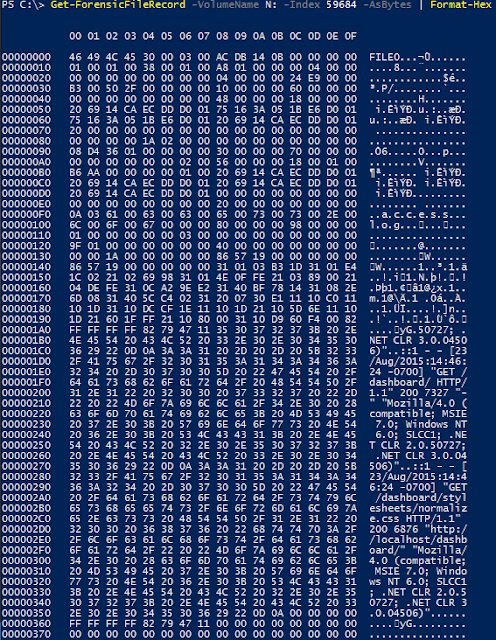 You can see the FILE0 signature and a couple human readable strings (such as “access.log”). 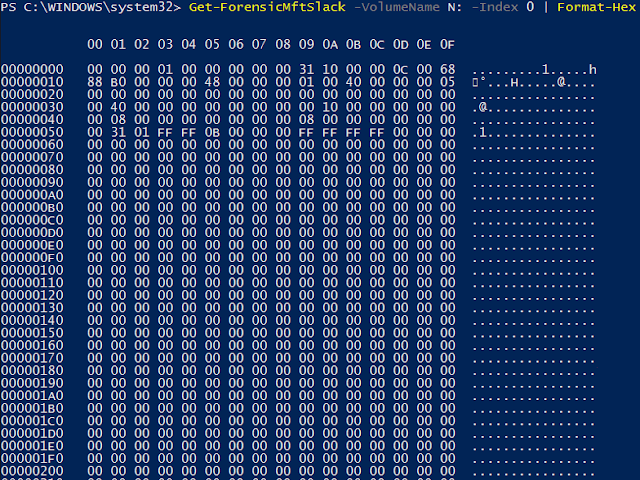 Now if we compare the output of Get-ForensicMftSlack, we see the same data that is at the bottom of the previous picture. This is the slack space! Sometimes slack space can contain contents of deleted files or file system structures. The image below shows that the difference between AllocatedSize and RealSize is the same as the number of bytes returned by Get-ForensicMftSlack.